On March 7, 2013, researchers from the MIT Energy Initiative and Stanford’s Hoover Institution met in Washington, DC, to explore the latest energy technologies and to advocate for stronger and sustained investment in research and development to help move these technologies from the lab to the marketplace. The gathering was the third and last in a series of meetings aimed at identifying “game-changing” energy technologies. These clean energy technologies, meeting participants argued, can boost America’s long-term economic growth and allow us to confront our nation’s growing energy needs, security concerns, and environmental challenges such as climate change. During the daylong event, the researchers examined three critical technology areas: transportation, electricity and the built environment, and infrastructure. The first panel, chaired by Sally Benson, director of Stanford’s Global Climate and Energy Project, focused on transportation and the need to reduce oil dependency. MIT Professor Gregory Stephanopoulos spoke about creating renewable biomass from algae. His MIT colleague Daniel Cohn then explained the process of turning natural gas into a liquid fuel to create super-efficient vehicles at a low cost. Representing Stanford, Yi Cui spoke about the future of battery technology. Panel discussion on “Electricity and the Built Environment: Decarbonizing Energy,” chaired by Arun Majumdar, director of energy initiatives at Google (far left). Panelists include (left to right): David Parekh, vice president, research, and director, United Technologies Research Center; Burt Richter, director emeritus of the Stanford Linear Accelerator Center; and Vladimir Bulović, director of the MIT Microsystems Technologies Laboratory. Arun Majumdar, Google’s director of energy initiatives and founding director of ARPA-E in the US Department of Energy, chaired the second panel and turned attention toward low- or no-carbon innovations. Vladimir Bulović, director of MIT’s Microsystems Technologies Laboratory, highlighted the creation of paper-thin photovoltaics and ways to integrate solar cells into transparent surfaces. “The windows that you have to be utilizing every day can become active surfaces,” Bulović said, eliminating the installation cost of the solar panels themselves. While achievable, these cutting-edge technologies are at least a decade away from being used at a large scale. Also on the panel, David Parekh, vice president, research, and director of United Technologies Research Center, spoke about the need for energy-efficient buildings, while Stanford Professor Emeritus Burt Richter gave an overview of nuclear energy. The final panel, which explored the need for a smarter, more secure energy infrastructure, was led by Munther Dahleh, associate head of MIT’s Department of Electrical Engineering and Computer Science. MIT Professor Saurabh Amin talked about the need to create a resilient energy infrastructure protected from the threat of cyber-attacks, while the Lawrence Livermore National Laboratory’s Julio Friedmann spoke about advances to the smart grid. The Hoover Institution’s Gary Roughead ended the panels with a talk on defense energy needs. He said that energy was central to the military. But at the end of the Iraq War, he noted, “energy was also costing us lives” because at least one young American died per fuel convey. Since then, the military has begun using more solar energy and biofuels and improving efficiency. Some of the technologies discussed during the panels are ready to be deployed but are on hold because of the need for policy action. Others—though full of potential—require either a strong R&D push to make them market-ready or sustained R&D support and many more years of research before they can be fully realized. On this front, the research community faces a significant challenge: lack of funding. MIT Energy Initiative’s Robert Armstrong welcomes participants and attendees for the day’s events. 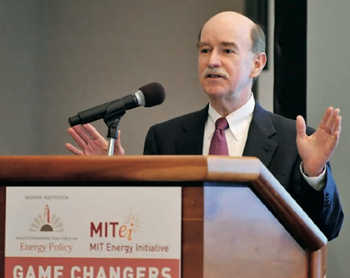 Professor Robert Armstrong, then-deputy director of the MIT Energy Initiative, quoting comedian Will Rogers, said, “Even if you’re on the right track, you’ll get run over if you just sit there.” Without strong investments in research and development, that is what America will be doing. According to a recent report from the American Energy Innovation Council, to maintain America’s competitive edge and strong economy, the nation needs sizable, sustained investments in clean energy innovation. The council estimates the minimum amount to sustain this would be $16 billion per year—$11 billion over the current spending of about $5 billion. “Today, as the world faces grave challenges around energy, climate, and related challenges of water and food, society needs the creative force of its universities more than ever,” he said. Where will the money come from? Those participating in the conference agreed that the necessary investments in R&D must come from both government and industry. Collaboration on both fronts is critical, MIT President Emerita Susan Hockfield said, with industry bringing valuable knowledge about the marketplace to research that will need to meet the needs of that marketplace. She cited the creation of public-private partnerships as one of the most important recommendations from President Obama’s Advanced Manufacturing Partnership, which she co-chaired. 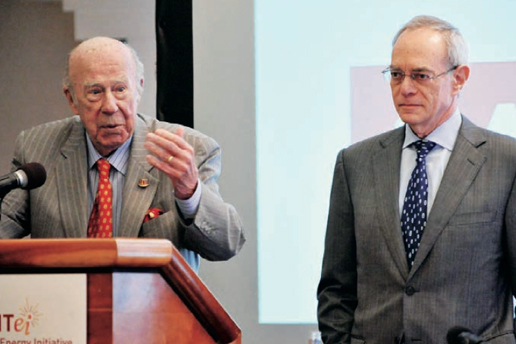 Reif and Hockfield both emphasized that the need for deep collaboration and support is important not just for the realization of the projects discussed at the meeting but also to feed the visions of a generation of future innovators. Reif pointed out that budget figures don’t capture the number of brilliant young scientists and engineers who, discouraged by a lack of funding, could walk away from research, causing the United States to lose a generation of transformational energy ideas.